Last night, I watched live as some of the best baseball writers in the country fielded questions from former Boston Globe coworker Pete Abraham and an audience of 300 other crazed baseball fans like me. And yes, as I said I would, I tweeted my brains out. See below for some of the highlights of the 2-hour panel discussion. While I'm no longer working directly in sports journalism as I was at the New York Daily News and the Boston Globe, I still pay attention to the scene and read various beats and writers daily. 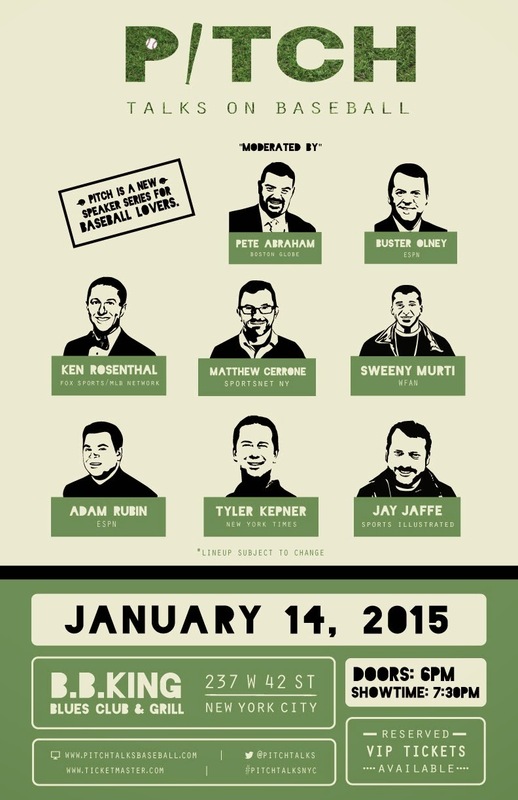 An organization called PITCH: Talks On Baseball, a new speaker series about baseball, has planned what sounds like an awesome event that features some of the top baseball writers in the country: Pete Abraham, Buster Olney, Ken Rosenthal, Matthew Cerrone, Sweeny Murti, Adam Rubin, Tyler Kepner, and Jay Jaffe. It's not very often an event with this caliber of writers comes along, so I will be in attendance tonight and, of course, tweeting my brains out. It's been a long time since my last writing here but thought there'd be no better a time to return to the blog six years and a day after I started it. Brian Cashman has made a slew of small moves this offseason that has made the the Yankees a younger team, acquiring a pair of 24-year-olds: Derek Jeter's replacement Didi Gregorius and starting pitcher Nathan Eovaldi. Not exactly the two huge names Yankees fans have become accustomed to welcoming. But maybe that's just what the Yankees need after missing the playoffs for the second straight season. The Yankees are younger and projected to be a much better defensive team than they've been in years. Getting younger and better defensively are two key ingredients to winning, but in the end it's all about scoring and preventing runs. Using pure statistical analysis, FanGraphs projects the Yankees to have a +14 run differential in 2015, ranked 15th overall for an 83-79 record. Doesn't look like the Steinbrenner family can honestly expect a championship in 2015. But that's what faithful fans like me are here for – to attend games, cheer passionately, and not lose hope. That being said, here's what the Yankees are working with in 2015. And here's what it will take for these Yankees to win it all.